Once they’ve become accustomed to life without stabilisers, purchasing them a mountain bike that they can use to explore every type of terrain is the logical next step. Buying them a mountain bike that promotes comfortable posture and gear use will have them confident in no time, and they’ll soon be racing ahead of you on your next biking holiday and exploring the local landscapes with their friends. When it comes to choosing the best kids’ mountain bike for your child, it’s less about the ins and outs of the frame and more about the wheel size. Before you go ahead and purchase a bike, make sure you know your child’s height; Evans Cycles has a helpful chart that tells you the size of wheel you should be looking out for. Then it’s down to your personal preferences. Think about how many gears you want the bike to have, whether you want to pay extra for disc brakes over V-brakes, the weight of the bike and for older kids, whether you want to them to benefit from front wheel suspension. When a bike has been developed by a 6 time Olympic champion, you know it’s going to be good. With the lack of ineffective suspension forks, this bike remains lightweight and well thought out, with the frame specifically designed to ensure small riders remain comfortable on the saddle. The frame sits as low as possible on the wheels, which makes the bike sturdy and ready to handle all types of terrain, while the 8 speed gears are simple and effective to use, so they shouldn’t need to worry about dropping the chain as they power through the terrain. Suitable for children between the ages of 9 and 13, this bike has a more grown up feel to it. From the 21 gears that take a greater level of understanding to control effectively to the front suspension that makes it heavier but more comfortable when they’re covering uneven terrain. With its aluminium frame, the bike still remains comparatively lightweight and strong, while the addition of front and rear brakes makes the bike more effective, especially when they’re zooming down hills. With its 7 gears, wide tyres and vibration absorbing seat, this bike has been made with little explorers in mind. The 20 inch wheels make this bike ideal for children who are ready to say goodbye to their first bike, with the 7 gears enabling them to become familiar with the workings of a more adult bike and a lightweight frame ensuring they don’t find inclines overly hard. The bike comes with a kickstand so they don’t need to worry about finding something they can lean it against, while the pedals come with reflectors, ensuring, along with lights, that they’re visible when cycling near a road. If you’re looking for their first ‘proper’ bike to be more trail ready, this one from Specialized is certainly one to consider. 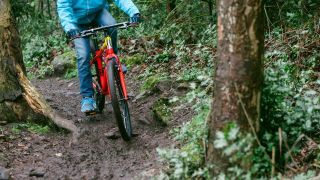 The front end has been designed in such a way to allow them to gain confidence as they tackle downward beginner trails, with the 7 speed gears simple enough to use but providing enough variation to zoom along all levels of terrain. The frame itself is made from lightweight aluminium and with three colour patterns to choose from, there’s a bike for all tastes. If you believe 20 inch tyres are going to be too big for your child, Townsend also produce bikes with an 18 inch wheel, making them perfect for younger children who happen to be taller than average. Designed with just one gear, this bike is perfect for children who are ready to move on from stabilisers but aren’t quite old enough to grasp the concept of using gears. With tyres designed specifically for tackling off-road terrain, they’ll be speeding along happily on your next trip out on the bikes and with a cool lightning design, they’ll enjoy showing off their bike, too. Although this isn’t a traditional kids’ mountain bike, it’s certainly worth a mention, especially if you want to start your littlest child off early. With no pedals or stabilisers, it’s all about learning to balance, and once they build enough speed to take their feet off of the ground, the transition between a balance bike and their first proper kids’ mountain bike should be seamless. The tyres are chunky and robust, perfect for exploring the local terrain, while the frame is made from lightweight aluminium, which will make scooting along as easy as possible.